Are You Concerned About Boondocking Safety? 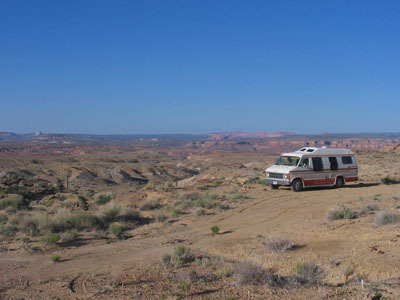 Many RVers are held back from the joys of boondocking by concerns about boondocking safety. Aside from the amenities and full hook-ups, safety concerns are the reason most people cite for preferring developed pay-campgrounds. If you've made up your mind to be paranoid, you probably won't even be reading this but, if you're looking for boondocking safety information and advice to put you mind at ease, read on. Being female, I know how, particularly for women, instincts can kick in when dealing with the unknown. Also, like most people, I'm prone to being influenced by what I hear from others. When we started on our first year-long RV trip in 2000, we found various locations across northern Ontario to spend the night by boondocking but, before crossing into the “big bad States” (ooooo I was afraid), I insisted that if we were going to camp in "questionable places," we needed some sort of protection - a weapon!. So before crossing the border, we stopped at a hunter's outfitting store to purchase "Bear Spray". This is, in essence, pepper spray. The packaging makes it clear it is to be used as protection from bears only, not from people. So, feeling a bit better, at least no longer afraid of a bear breaking into our RV while we were sleeping, we crossed bravely into the USA and Northern Michigan. Because we didn't know the ropes yet (we hadn't even heard of boondocking, never mind boondocking safety), we weren't aware of the fabulous inexpensive and free camping opportunities in the National Forests we were passing through. A week or two later, crossing the Big Horn Mountains in Wyoming, we met a couple who had been traveling for months. They told us they only camped in "dispersed camping areas" in the National Forests. Because other people - hikers, hunters, fishermen and RVers use these isolated free campsites all the time, we realized they must be a safe option. From this point on, we discovered many other boondocking opportunities to camp in safe legal locations that suited us perfectly for not only cost but also privacy and scenery. Read stories about boondocking safety contributed by other RVers or tell us about your own experience here. 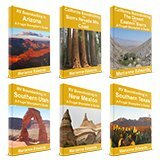 At rv-adventuring.com, you'll enjoy the personal story of a full-time RVer's adventures and mis-adventures on the road. Boondocking (or dry camping) refers to RV camping in a remote area, without being hooked up to water, power, or sewer. For me, there were three parts to dispelling my initial fears about boondocking safety. Hearing about other's experiences and taking comfort in their recommendations. Experiencing boondocking in remote locations first hand without incidence. And most importantly, thinking rationally about my fears and what really was behind them. So, while I hate to say that "fear is all in your mind", it would seem that it is. And you can change your mind. That's not to say there aren't places and reasons to be cautious in this world. Not only where RVs and boondocking safety are concerned but, in any situation, you need to let your own common sense rule. I truly believe that everything in life, even sitting in a chair and breathing, involves some element of risk. Each of us decides for ourselves every day what risks we are willing to take. If your risk tolerance is exceptionally low, you're not likely to be traveling at all or reading this boondocking safety web page. When it comes to quieting our fears, nothing's more effective than knowledge and experience. From ten years of boondocking experience, here are my common sense conclusions, insights, and boondocking safety advice. When it comes to robberies, I know that, statistically, I'm much more likely to be a victim in my house than in my RV. Setting up camp down a dirt road on public land makes me no more a target for a thief than anyone who builds a home or cottage on a country road in a remote area. My RV is much less appealing to a thief than a permanent residence in that I don't have the same amount of valuable removable furniture or fixtures that can easily be converted to cash. I'm often only camped in one location for a day or two. Not enough time for a thief to scope the place out and get to know my routines. I admit that, like many people, at home I don't know some of my closest neighbors and I have very little time or interest in seeing who comes in and out of their yard. Most RVers will agree that, when traveling, we're much more likely to get to know our neighbors. We also have more time on our hands to be nosy! Enough that, without realizing it, we're keeping an eye on our neighbor's property. In most boondocking areas, the common courtesy is to leave space, a few hundred yards minimum between campers. In campgrounds, where units are closer, if someone (a stranger) is walking towards or around the immediate area of your unit, it may not be as obvious or noticeable. We use common sense when selecting a place to stop. When it comes to boondocking safety we trust our intuition and drive on if the environment doesn't "feel" safe. The further from civilization, the more safe it feels to be camped where we're totally alone. There's safety in numbers. This holds true for boondocking safety. Especially when we're closer to urban areas, we want others, RVers, truckers etc. within view. Most thieves are lazy. That's why the majority of RV break-ins occur within easy access of the cities where most thieves hang out. We avoid boondocking when we're within a short drive of the biggest cities. Most thieves don't want to deal with any type of struggle so the easiest time to steal our possessions is when we're not in the RV. As with any parked vehicle, we don't leave cash in the RV and keep valuables out of sight. Because we're inside our motorhome at night, our RV is much more likely to be a target in the daytime or evening while we 're parked for shopping, dining out, or going to a show in any urban location than when we're camped in an out-of-the way boondocking site. Think about what signs you're displaying. What does your RV say to the passer by? We don't have the option to control our out-of-town license plates, but we can control any other signs that we post. Don't advertise your name anywhere outside of your RV. Someone could knock on your door in the middle of the night calling out your name -- trying to make you think it's someone you know. If you want your fellow RV friends to be able to find you, do carry a distinctive sign or flag. Not something that shows your name or address. Avoid stickers that indicate you're a full-timer. These could be a boondocking safety concern, making you a target, because they indicate that all your worldly possessions are onboard the RV. When it comes to boondocking safety there is some signage that could help to protect your RV. If traveling alone, put 2 chairs, an extra pair of men's shoes (size large), or a large dog water-dish outside your door. Our first used RV came with a sticker for Ducks Unlimited.Although we don't carry guns, we felt it gave the impression that we might, so we left the sticker on the vehicle. I would, however, avoid stickers such as “NRA” or "Protected by Smith and Wesson" because these might give you problems with police and border patrol personnel who could use them as sufficient reason to search your vehicle. What if you still feel unsafe and want added security? What are the best protective self-defense devices to have for boondocking safety? A vehicle that is ready to drive away from a dangerous situation. The safest is an RV where you can access the driver's seat from the bed without going outdoors. The common sense to hand over whatever cash and material possessions are demanded without any hint of objection. A dog, large enough to intimidate and trained to follow through on your command. An audiotape of a barking dog that you can turn on immediately when needed. A working installed alarm system that sounds a loud alarm. A loud alarm that you activate manually by touching a button. A cell phone with a charged battery…so you can dial 911. The intruder will most likely be in and out by the time the authorities reach you but, seeing or hearing you make the call, may be enough to scare him off. So, even if you're camped where you don't have a phone signal, it's a good idea to "fake" the call to 911.
Pepper Spray. It has a shelf life and must be replaced when it expires. Be sure you practice how to hold it, so you don't end up spraying yourself in the eyes. In Canada, pepper spray is sold as bear spray and it's illegal to use it against humans. An alternative to pepper spray is a spray bottle filled with straight chlorine. It can cause serious damage, burning an intruder's skin and eyes, and is not illegal to carry in any country. Firearms and Stun guns all come under laws that vary from state to state. Although you may live in your RV you should be aware that the law is not the same as it is for having a firearm in your home. If you are a person who carries a gun, be sure you know how to use it and know the laws of each state and province. Personally, I believe that by carrying a gun, I'm providing one for the intruder to use against me or in his next burglary. If you do carry a firearm, are you prepared for the consequences of actually having to use it? The same goes for any object that you have to actually wield at the intruder --a knife, a club, a tire iron. Is this something you could actually do without a moment's hesitation? I'll end this segment on boondocking safety by telling you about the only time we have ever encountered a feeling of danger while boondocking. Despite all I've told you above, it was in a very remote desert location, near Gila Bend, Arizona, miles from any "big bad city." After visiting the nearby pictographs, our chosen campsite for the night was on BLM land, about 200 feet in from the road. There were 2 or 3 other RV's in the area, but we had chosen to camp far enough away to not be within their view. It's now Sunday morning about 9 am. We are just up and getting dressed, when Randy looks out the window to see an old beater of a car, a driver and one passenger, driving off the road and over the desert toward our RV. Looks like trouble for sure. Randy (brave man) says he will step out to see what they want. I'm not even fully dressed, but I scramble to see if we have a cell phone signal and get the bear spray canister poised and ready. My heart is in my throat as I look out to see what's happening. The occupants are still in the car. Randy is in conversation and I can pick up small bits. Sounds like he's talking in a normal voice. He's thanking them. Maybe they're selling something or are lost and asking for directions? A few minutes later, they pull away and Randy returns smiling and carrying a copy of The Watchtower. We kept that little magazine and have told the story often. It shows that the followers of the Jehovah's Witness faith really are willing to go to the ends of the earth to spread The Word. At the same time, it reminds me that, no matter where I am, if trouble is going to find me, it can find me anywhere. And that, no matter how conscious I am of boondocking safety, my life is always in the hands of a higher power. Please share your own boondocking safety advice. 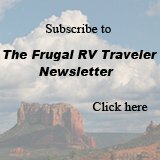 You can read stories and advice contributed by other RVers or tell us about your own experiences here.